Hello everyone! 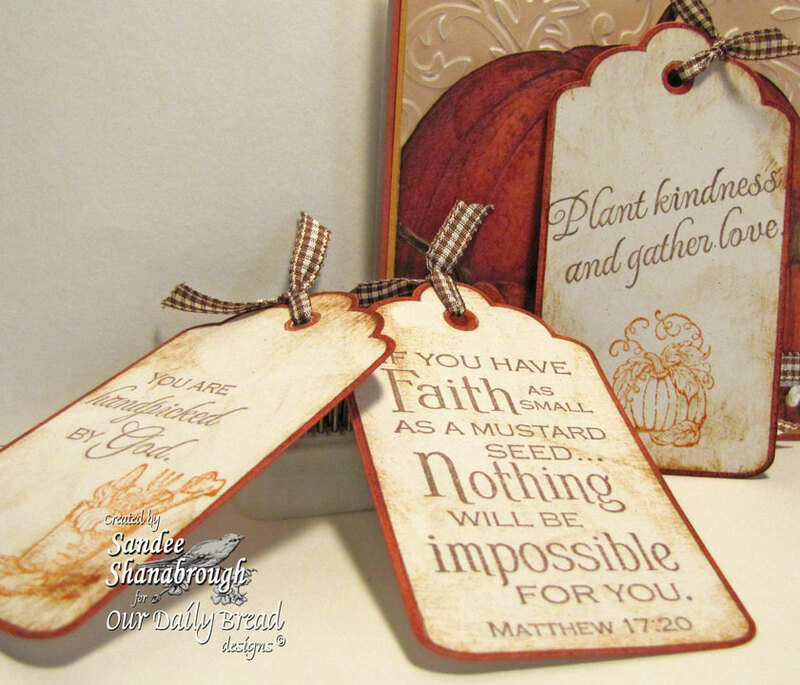 Here is a peek at one of the new sets being released on Oct 1st from Our Daily Bread designs! This single stamp set is called Joy Tree and is perfect for quick simple cards! This set of six cards also meets my Christmas Card Challenge with SCS for the month of September! I challenged myself to make 5-10 Christmas cards each month and so far I have met my goal! WooHoo! Each tree is heat embossed with white embossing powder. 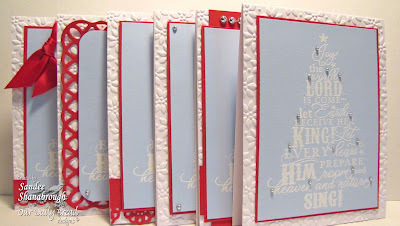 The poinsettia embossed back ground is done with a StampinUp! embossing folder. One card has the Spellbinders lattice die cut and two cards have punched borders. 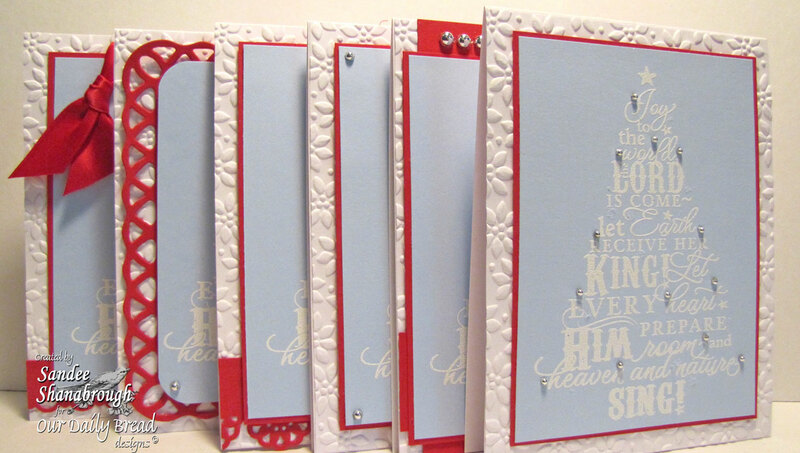 All cards are decorated with silver rhinestones, buttons or ribbon. And each card is sprayed with Marshmallow Glimmer Mist. Thanks so much for looking! Hope to see you for the monthly release blog hop this Saturday, October 1st!!! Enjoy the rest of your week!! Hi there! Happy Saturday night to you! I experimented with border punches for this card. 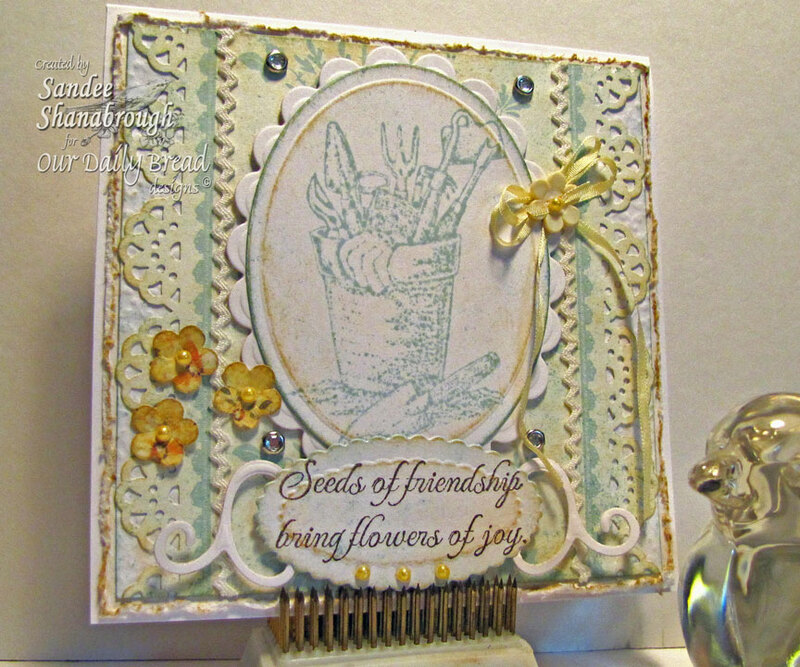 After coveting some of the new Spellbinders border dies and reminding myself for the umpteenth time that now is not the time to spend more money, I made do with my punches!! I've got three layers of card stock layered together here with a different punched border on each. There is one layer of K&Co designer paper which is embossed with the Vintage Border embossing plate from Our Daily Bread designs. The sentiment is from the new Garden Tag set. 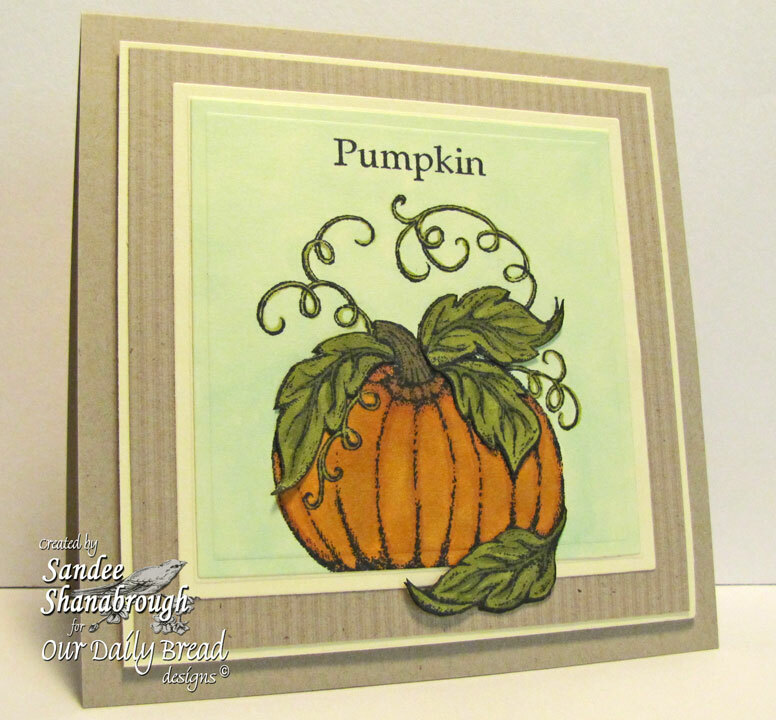 I stamped it and cut it out with the Elegant Ovals die and framed it with a Labels 4 die cut. The label is popped up with foam tape. Then I cut out a strip with the Crochet Border Die and added it upside down behind the vintage lace and ribbon and flower! I added a few pearls on the border to complete the card! Please join the ODBD Challenge team for their latest challenge to showcase a scripture, sentiment or song! You can get the details HERE! Thanks so much for visiting with me tonight! Enjoy your Sunday and I will see you again soon! Hi! Hope you are having a great week so far! Don't you love the Fall? It is my favorite time of the year! There is such a clean crispness to the air! And the earthy colors of fall are so gorgeous!!! For the Shining the Light Challenge on the Our Daily Bread designs Blog this week, the challenge is Fall! The pumpkins you see are cut out with my x-acto knife from a larger sheet of designer paper, layered over a piece of embossed vellum and then to card stock. This created a nice little pocket for my tags! I used three of this months ODBD new releases, Garden Tag Set, The Good Seed, and Seed Packet. The tags were cut out with the ODBD custom tag die! Just wanted to remind you that you have another couple of days to take advantage of a great deal at the Our Daily Bread designs store!!! Click HERE to get all the info and remember to sign up for ODBD emails!!! Thanks so much for looking! Happy Fall Y'all!!! I am not very skilled at applying it however. I tend to put way too much! LOL! 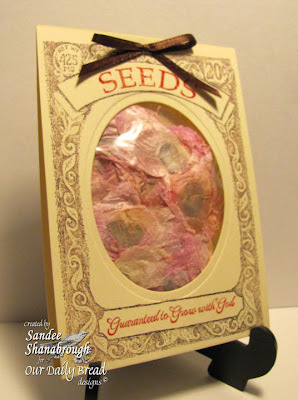 Here I have used the Flower Soft Lavender Papercraft Kit along with the new set from Our Daily Bread designs called The Good Seed. I cut out the ovals with the coordinating Spellbinders Ovals, added the Flower Soft and cut out the butterflies to attach. The ribbon is from Really Reasonable Ribbon. The bow is made with a Bow Easy tool. I added a little snip of lace and then the button and pearls. I colored the button and pearls with a copic marker to get the pale green color. 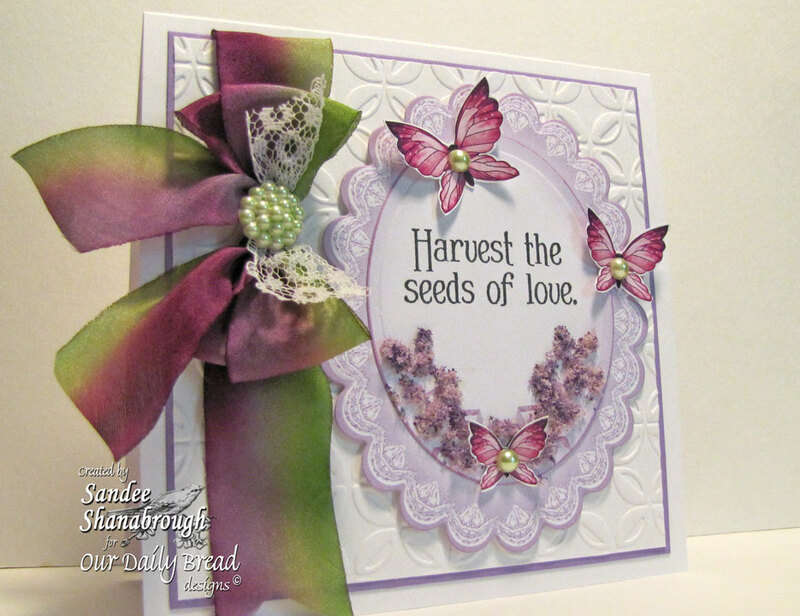 The embossing folder I used for the background is from the Cuttlebug Preserves set. Thanks so much for visiting! See you again soon! Hi y'all! 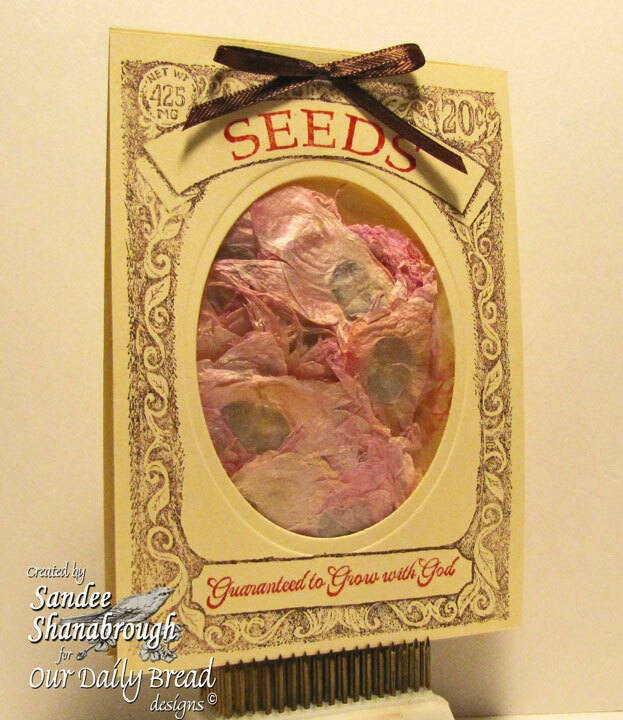 I have a card to show you tonight using a new set from Our Daily Bread designs called The Good Seed. I stamped the image with Soft Sky re-inker since I don't have the ink pad for this SU! color! I always like the watercolor-y effect when using this technique. And it matches nicely with the Anna Griffin paper in the background. 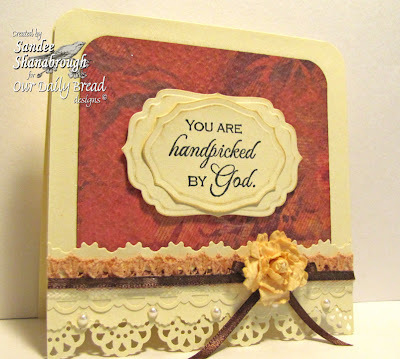 On each side of the background paper I punched the lace edges and added vintage rick-rack. 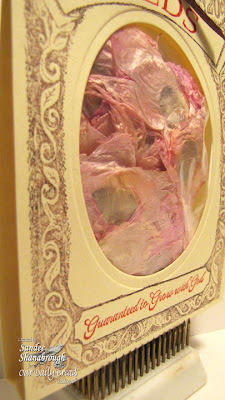 I layered this over a sheet of paper that is embossed with the Vintage Border Embossing plate and layered this over another sheet that is distressed on the edges and adhered to the base card. I cut out the main image with a Spellbinders Oval and added it to the Spellbinders Scallop Oval. 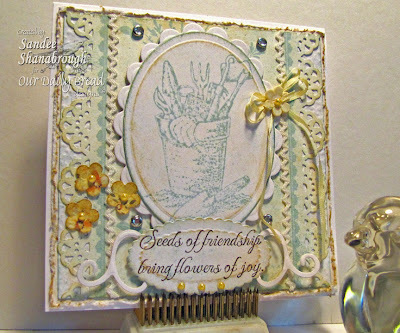 The sentiment is stamped on another Spellbinders Oval and attached to a Spellbinders Fancy Tag. I added some SU! punched flowers that were on my desk, the ribbon and button, the SU! rhinestones and finally, Zva pearls that were colored with a copic marker in yellow to match. Most of the paper edges were distressed with ink too for a shabby look! Thanks for stopping by! Hope you all have a wonderful weekend! I stamped the image twice and colored with copics. I cut the leaves from one colored image and popped them up over the other image. I did the out of the box technique so that the leaf would hang down from the Spellbinders Square cut. The striped background is a sheet of Kraft designer paper from StampinUp! No ribbon, no stuff, just pumpkin! LOL!!! Lots of layers but still CAS for me!! Thanks so much for looking! Hope you have a great Sunday! 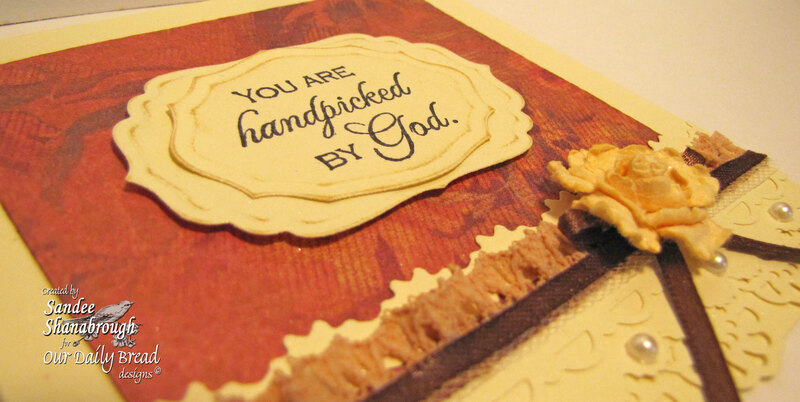 Welcome to the Our Daily Bread designs September release blog hop! I am your first stop in our hop today! If you want to follow along, please start from the ODBD Blog so you don't miss anything! The Hop will run 8am EDT September 1 til 8pm EDT September 2. The winners will be announced on the ODBD Blog on September 3. There will be FIVE prizes! Five blessed people will win $15.00 Gift Certificates for the purchase of any stamps in the ODBD Store. These certificates will be good for 6 months! Hop to each designer’s blog and leave a comment. Return to the Our Daily Bread designs blog and leave a comment telling us that you completed the hop, making note if there were any you could not comment on. Then remember to answer the question in your comment on the ODBD blog. This month's sets are so fun! The possibilities are endless, as you will see when you hop to all the designers' blogs today! I used the Seed Packet set to create my little project! This was super easy to make! Cut your 8 1/2 x 11 card stock in half longways. Score at 5 1/4, 5 1/2, and 5 3/4. 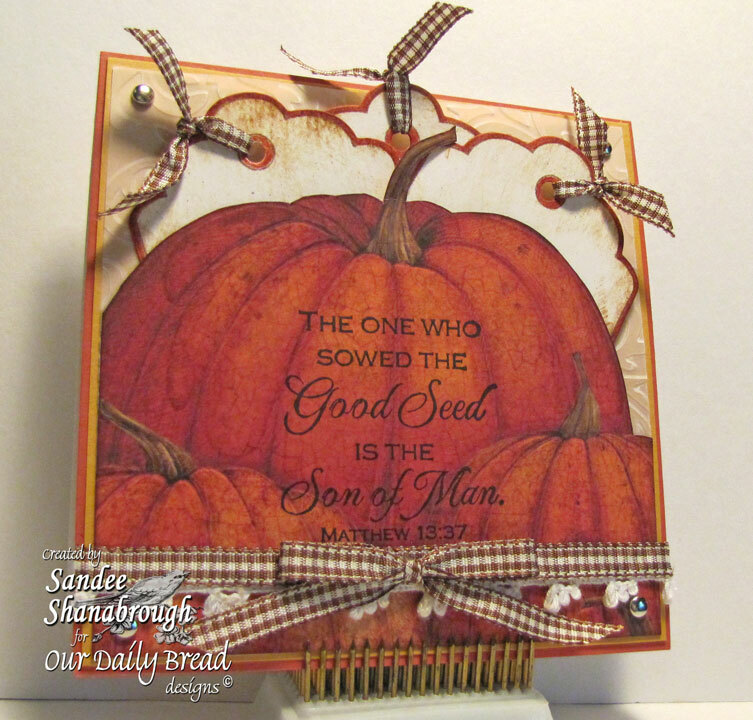 I stamped the seed packet frame and the coordinating sentiments. Then I used a Spellbinders Oval to cut out the center of the frame. I filled a plastic zip-lock baggie that I use for Artist Trading Cards with some Arnold Grummer's PaperMaking Angel Wings. I never get out my paper making paraphernalia anymore so this is my way of using things I have on hand but have never used! But you could fill with candy or sunflower seeds or just about anything! Then it was just a matter of folding along the score lines, stapling at the top, making sure to staple the baggie inside too. Then I made a little bow with my Bow Easy and glued it down to hide the staple!!! A quick, simple gift for someone or even a party favor!!! Now on with the show!!! From here, you will hop to Angella’s Blog! She always has something beautiful to inspire us! We really love having you spend some time with us today and always! !